Fred and Tom are shown here on Tom's bus after FPB's cranking performance at the Syracuse Polish Fest in Syracuse, NY on June 8, 2007. Frank is pictured here playing bass during FPB's gig on June 8th. Frank and Fred are pictured here cranking out a tune during FPB's cranking gig at the Syracuse Polish Festival on June 8, 2007. Rick keeps the beat on June 8th at FPB's gig at the Syracuse Polish Festival. Fritz and Gabe are shown in action during FPB's performance in Syracuse, NY on June 8th. The guys in FPB are pictured here with Laura Hand and Jack (from WSTM in Syracuse, NY). Laura did an interview with FPB, prior to FPB's cranking gig at the Syracuse Polish Fest on June 8, 2007. 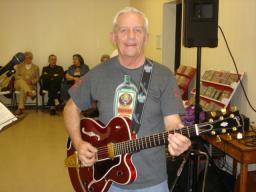 Fred with his Excelsior on May 20th in Copenhagen, NY at the Copenhagen Fire Hall. 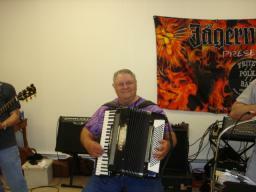 Fred smiles as Fritz plays a tune on the button-box accordion in Copenhagen, NY on May 20th. 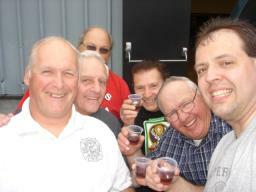 Tom, Gabe, George, and Fritz tip some Jagermeister punch with Gerald (L) and Warner (R) shortly after FPB's second set on May 20th. Tom with his Gibson on May 20, 2007, during FPB's gig at the Copenhagen Fire Hall. 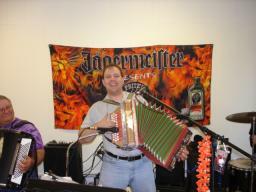 Fritz and Tom pose during FPB's gig in Copenhagen, NY on May 20, 2007. 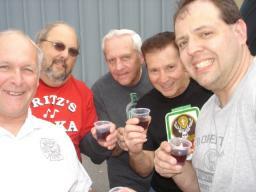 Gabe, Tom, George, and Fritz tip some Jagermeister punch with Gerald, on May 20th in Copenhagen, NY.